By 1945 everyone of importance in the electronics industry was blowing the figurative horn of television. The country would transform from "a chicken in every pot" to "a TV in every living room" (OK, I just made that up). The NTSC (National Television System Committee) had set the standards for transmission, but hardware implementation was by no means agreed upon. If my memory is correct, there were still some manufacturers clinging to the mechanical spinning disc with a projection screen rather than using electronic circuits and a CRT (cathode ray tube). Entire industries - not only electronics - were bursting at the seams in anticipation of the war ending and being allowed to release all the pent up knowledge and inventions developed during the years working toward the defeat of Axis powers across the globe being applied to creature comforts for the civilian marketplace. Television, with its countless dependents and dependencies, truly changed the planet. Some say for the better, others say for the worse. Skillful use of a nationwide television system immediately following the war would be a most powerful force to arouse the spirit of our people in the critical postwar period. 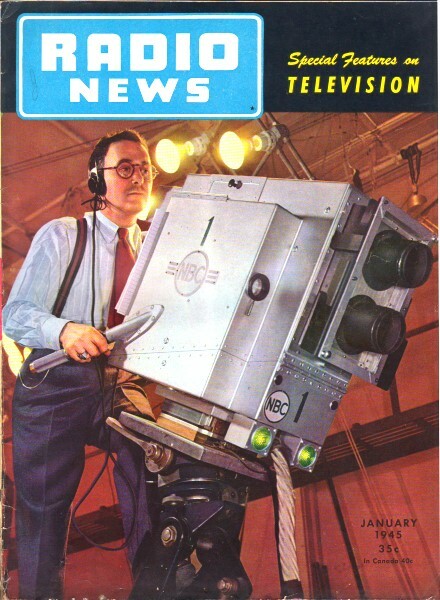 Production of television sets can, in the opinion of experts, result in the employment of at least 600,000 workers by 1948. That's a lot of jobs! It is estimated that video receivers will sell for an average price of $200.00 and that the demand for sets will create a market for 30,000,000 units during a ten year period. The immediate development of postwar television can certainly contribute greatly to a healthy business and economic life by its added purchasing power and by its employment of thousands of persons in our industry. Radio broadcasting has, in the past, sold its sponsors goods "sight unseen." Television, on the other hand, will permit Mr. and Mrs. America to actually see what they are buying. Thus - television becomes a servant of the people. This medium appeals both to the ear and to the eye. By adding motion to pictures - television will offer a "third dimension" to advertising. Its lifelike images will certainly attract the attention of the set owner far more than the customary oral ballyhoo of present programs. Testimony at the recent FCC hearings has convinced this editor that television is ready now! Existing technical standards are entirely adequate for good pictures. Frequency allocations are sufficient for a practical service. Improvements can, and will be made, in existing television transmitters, antennas, and relay systems as the art progresses without upsetting the function of receivers for many years to come. As proof that television is ready, and to bring our readers up-to-date on the subject, Radio News is devoting many of its editorial pages this month to a review of video progress. Television will offer a tremendous opportunity to raise another type of standard - that of doing away with "singing commercials" and other "spots" that have reached a very low level in radio programming. Yes - television producers will have an unlimited opportunity to contribute to a dignified service - one that can serve as a powerful medium for tile greatest number of people. We sincerely hope that those responsible for the production of television programs will set their standards high at the very launching of its career and keep them high. If they do, it will do much to encourage Joe Doaks and family to buy television and to use it. The miracle of Sight Added to Sound is at the very finger tips of this industry. It must not be held back!